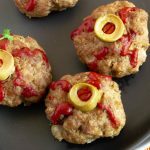 These creepy eyeball meatballs are a festive halloween food idea that you can do in no time. Juicy, tender meatballs dressed up for your halloween party! Filling, delicious and a scary fright for your guests to nibble on! One last easy Halloween themed food idea for your party this year! 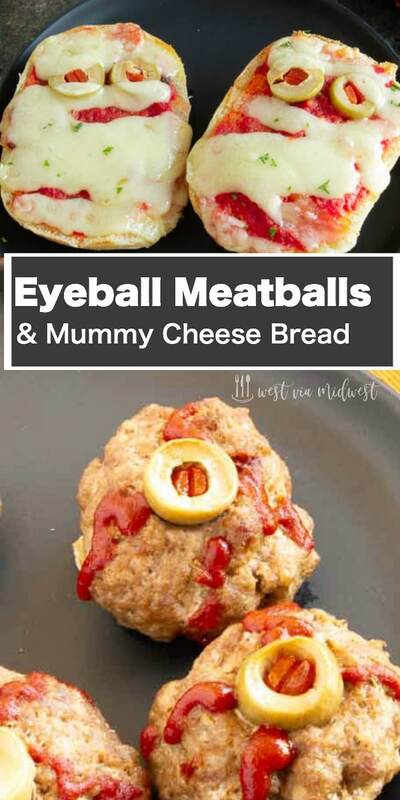 Creepy Eyeball meatballs that look a little bloodshot may look festive and spooky but each bite is made with a delicious, juicy, cheesy meatball. 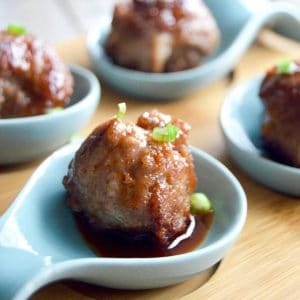 Can delicious bite sized meatballs be any more fun? It’s kind of funny how many meatball recipes are on my website, the last time I looked I think there over a dozen of them. 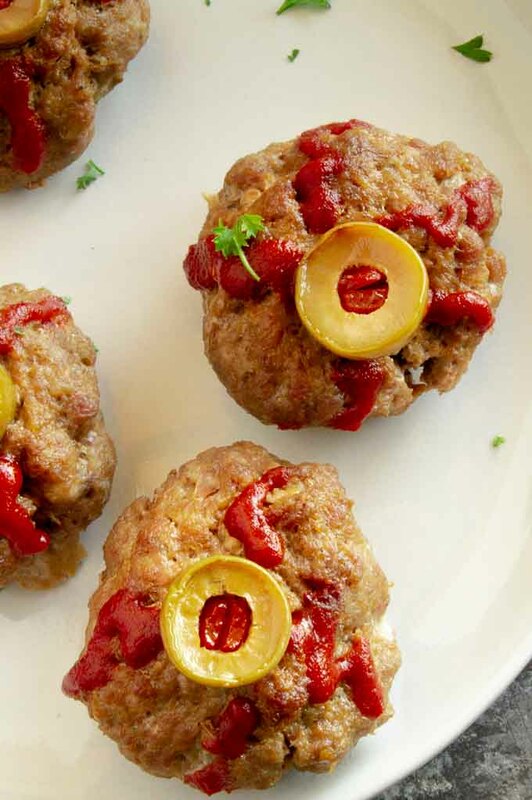 Check out this round up for all the Party Meatballs you would ever need for entertaining! 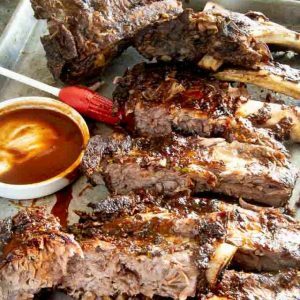 You name it they are on this list… subs, traditional flavors, exotic flavors, beef, chicken, turkey or pork… all of them! Until a few years ago I detested meatballs. I had a terrible phobia about wet bread in my meatballs. I know, it’s an odd thing to be creeped out by?!? Then my sister-in-law made these amazing meatballs that had no bread in them, but instead had potatoes in them. I sat there watching her make what at the time I thought was thousands of them telling her no thank you I hate meatballs and don’t want any of them. Then I had one. Seriously, they are to this day one of my very favorite meatballs to eat. When she makes them at the holidays she makes a HUGE batch and they take a lot of time to make but they are simply incredible. Making them with a light hand so they are tender. Adding a binder that keeps them together and keeps them nice and juicy. You can make them quickly. Allowing the formed meatballs to chill so they hold their shape after baking. It’s not required for a great meatball, but I really like adding cheese. 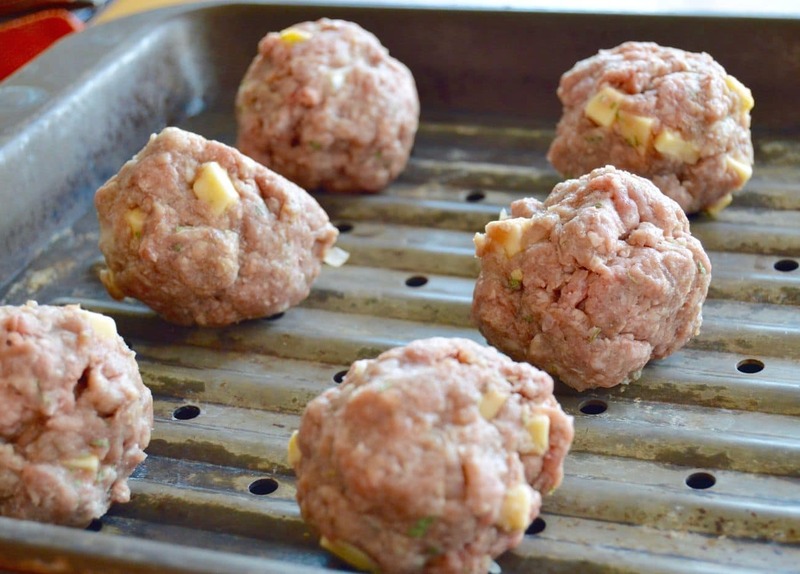 It adds an extra flavor boost to a great meatball recipe. Making the meatballs an even shape so when you bake them (or fry them) they all cook the evenly. Use your favorite meatball recipe or use the recipe Ive included here. Then its a matter of simple additions of adding the centers of the eyes and all the bloodshot veins. You want to cut the tip off of the olive. I used green olives and like the effect of the stuffed pimentos in the middle but you could use an olive stuffed with garlic or not stuffed at all. Of course black olives will work too. You want to cut the end that the pit came from. The open end. It will work the other way, but I find if you have the pointed end of the meatball still present it sticks in the meatball and tends to stay and doesnt fall off during baking. After you have cut the the tip off, when the time comes gently press the pointy end into the meatball. You dont need any special tools for piping, use a zip lock or plastic bag to be able to pipe the ketchup in. Put the ketchup in one corner of the bottom of the bag and press all of the air out and seal. Cut a small hole in the end where the ketchup is … then pipe bloodshot eyes around the eye center of the meatball. That’s all there is to make them! Didn’t I tell you they were easy! PIN THIS TO YOUR HALLOWEEN BOARD ON PINTEREST SO ITS EASY TO FIND WHEN YOU NEED IT! Vampire Blood Cocktail (Purple Tears) I just renamed a red drink for the occasion!! Form the meat into balls about the size of a golf ball. 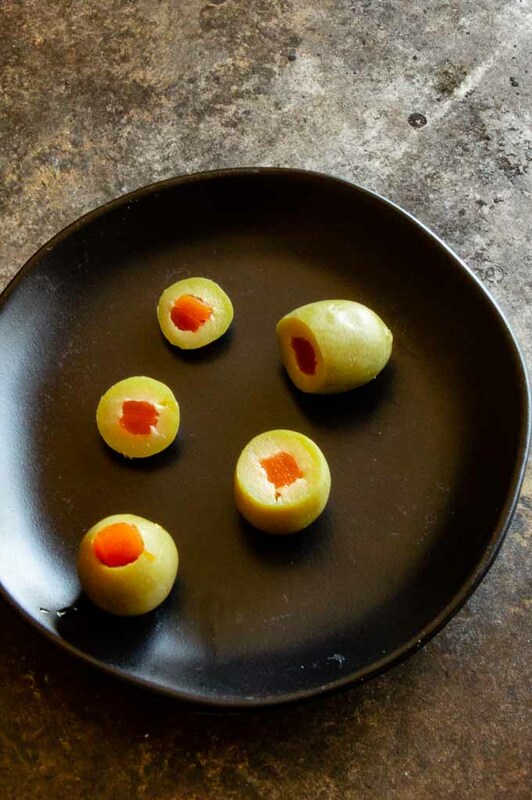 Cut the tops off of your olives. (See notes.) Press the olive point into the meatball to resemble eyes and place on a plate that will fit into the fridge for chilling. 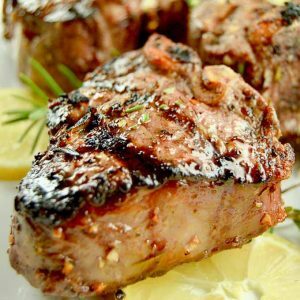 Repeat until all have "eyes"
Bake for 15-20 minutes, turning the pan from front to back at the 10 minute mark to allow for even cooking. Allow meatballs to cool for 5-10 mins. While meatballs are cooling place ketchup in a sealed zip lock back. Put the ketchup in one corner of the bottom of the bag and press all of the air out and seal. Cut a small hole in the end where the ketchup is ... then pipe bloodshot eyes around the eye center of the meatball. Serve. 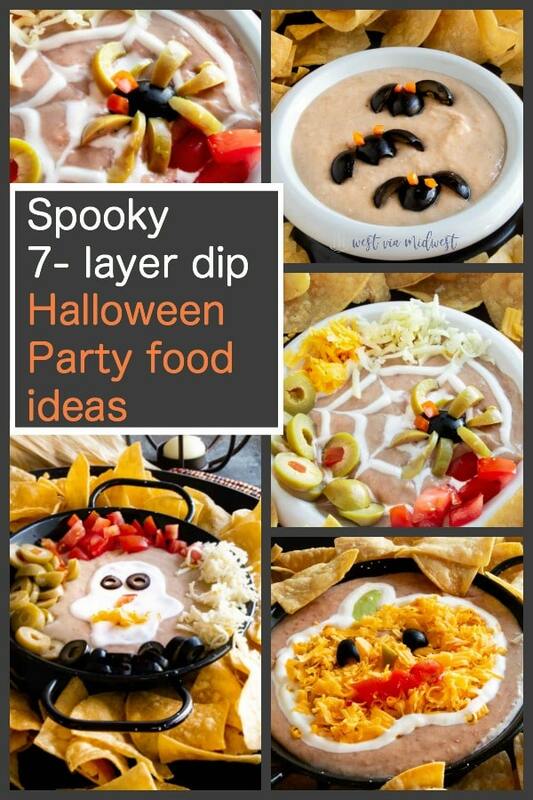 What a fun idea for a Halloween dinner or cocktail party. You are the queen of meatballs for sure! 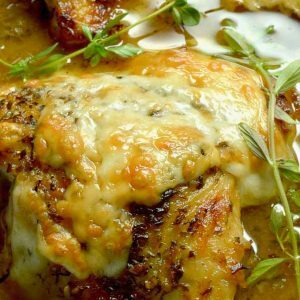 I saw your meatball post and I am amazed by all the tasty recipes. These are fun and delicious. I love the tip about using a zip lock bag for piping the ketchup.